After a more than a successful trip to Oregon exactly a year ago, we decided to chance our luck with its northern neighbour during July 2006. The trip started off in similar fashion with Praveen and great weather joining us at the outset. 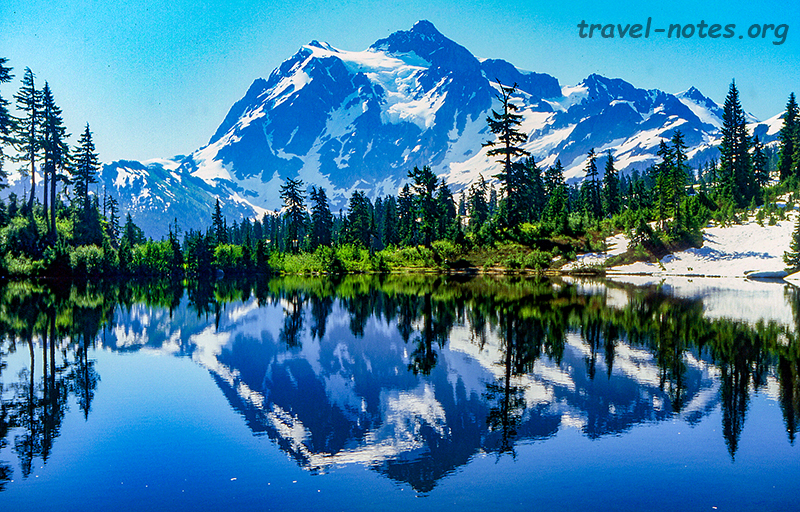 The first stop on the trip was Mount Baker, one of the many volcanoes that make up the Pacific Ring of Fire. We had done enough research to know that the last two miles of the Mt. Baker road would be under snow. But what we had in knowledge, we lacked in preparation. With fair weather hiking boots, we couldn't go too far on the trail. I somehow managed to end up on the wrong ridge, Praveen somehow managed to slide to its bottom while my wife decided to give up the entire attempt. The scar of the failure stayed with us for rest of the trip preventing us from attempting any trail that wasn't certified to be bone dry. The rest of the day was spent at the two drive-in view points, one at the Picture Lake with a stunning reflection of Mount Shuskan and the other at a viewpoint at the end of a forest road (FR39) that gave us the the view of the "other" side of Mt. Baker. The following day we drove on the Route 20, rated by some as the most scenic in the state, that took us through the heart of North Cascades. If you are interested in seeing the National Park and not the range, note that the land on either side of the road (for quite some distance) don't fall inside the park boundary. The only access to the park are the trails and the float planes. The route is dotted with a lot of lakes, most of them man-made - thanks to the dams, and all of them colourful - thanks to the glacial silts. The pick of the lakes is the relatively tiny Rainy Lake, located at the end of 1 mile stroll from the road. The best day-hike of the region also starts at the same location - the 3 mile long Rainy Pass trail which takes you tantalisingly close to the park boundary. Thankfully, neither the trail nor the pass lived up to its name and we had some breathtaking views of the Cascades from the top of the pass. Lake Chelan, the longest lake on the Cascade Loop is home to one of the regions famous tourist trap - a day long boat ride to Stehekin, a town on its other end, completely cut off by land routes to rest of the world. The trip (which gobbled up our following day) however was bit of a drag and easily avoidable on a tighter schedule - a 100+ ft Rainbow Falls and a chance to cruise on the nations deepest gorge notwithstanding. Our luck with the weather ran out around this time when our trip should have reached its high point - Mount Rainier National Park. We spent most of the next two days peering through the fog (mostly in vain) to catch a glimpse of the mountain. Despite the fog, we managed to get most out of the only hike we did in the park - a 5.6 mile (return) hike to the Fremont Fire Lookout in the Sunrise section. Most of the trail, especially the fire lookout, turned out to be above cloud level giving us some good views of the Cascades and Olympic range peeping at us over a carpet of clouds. 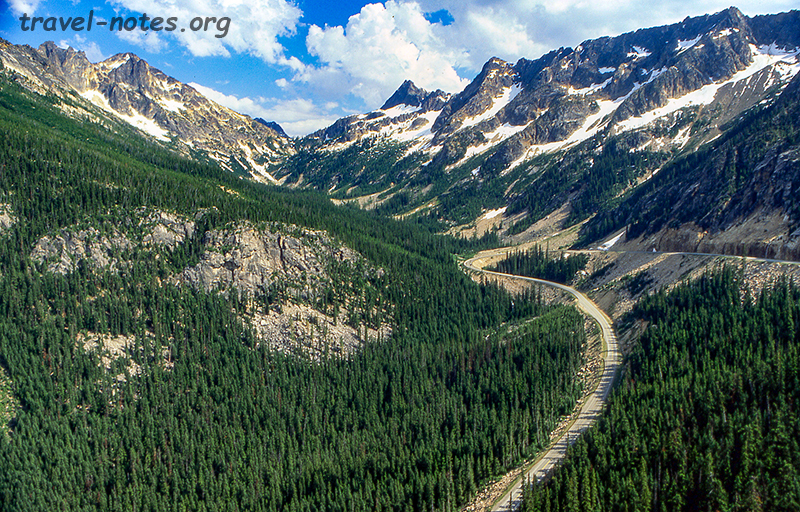 This, in the end, turned out to be the only view of the North Cascades National Park we ever got on the trip! The following morning, the weather cleared almost as dramatically as it had worsened a couple of days ago. The plan for this day was to drive the two off-beaten-path scenic drives of the region - one that puts you on Mount Adam's foothills and other that takes you to the non-exploded side of Mount St. Helens. Since we hadn't seen much of Rainier on our previous two attempts, we decided to trade the second drive to a return trip to the Mount Rainier National Park. After drooling at the peak and getting jealous of people with pickaxes attempting to climb it, we hit the one-lane unpaved forest road to Mount Adams. The high point on the drive was the reflection of Adams on Takhlakh Lake and it was a miracle we managed to make it there on a regular passenger car. In the afternoon we drove to the last of the volcanoes and only one to live up to its title in the recent history, Mount St. Helens. The mountain has been smoking for a while which had lead the authorities to close down the trail to its rim. With the best hike of the region taken out of the equation, we decided to spend the afternoon at the view points doing a bit of mountain gazing and Elk watching. The final day of the trip was spent in Seattle catching up with relatives and friends - which, thanks to Microsoft and Amazon, the city had more than its fair share. 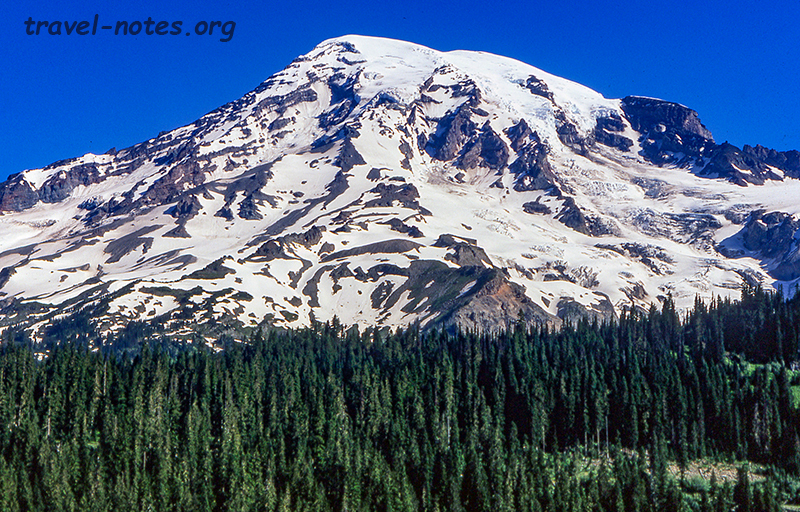 Click here for more photos from Rainier National Park. 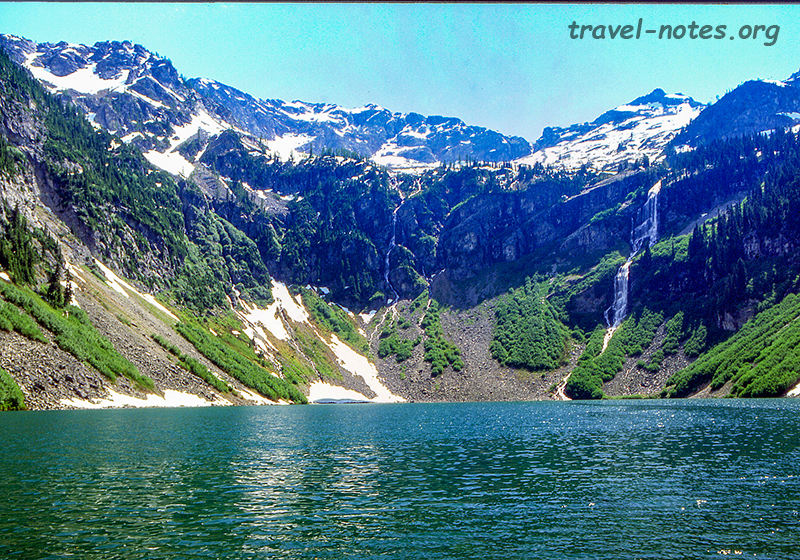 Click here for more photos from North Cascades National Park. Click here for more photos from Mt. Baker, Mt. Adams and Mt. St. Helens region.